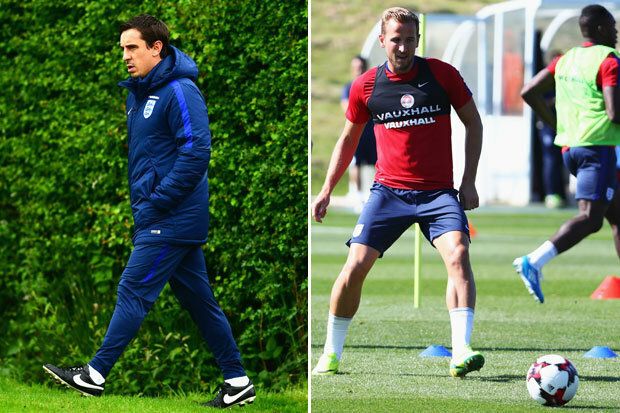 HARRY KANE was put on corners at Euro 2016 – and it was all down to Gary Neville. Starsport canreveal it was the former England assistant coach who decided Kane would be the best option to take them in France.Neville felt the dip and swerve that Kane could impart on the ball would make him the best man for the job.The Tottenham star took them against Russia in the group opener to little effect – before being removed from the duty after just one game. Manchester United star Wayne Rooney was handed the responsibility for the rest of the ill-fated tournament. England’s plan to use Kane on corners at Euro 2016 was slammed by fans and pundits. Alan Shearer claimed it was “bizarre” that Kane – a real threat in the air -was asked to take them.Ray Wilkins added that the decision “baffles the life out of me”.Sam Allardyce managed his first England game on Sunday and put Rooney on corner-kick duty. Kane, meanwhile, revealed he and the new Three Lions boss has been exchanging banter on the subject. Asked if he expected to take corners again, Kane said: “Probably not. “We had a bit of a laugh and a joke with the manager about it, but it’s something that happened. “I am happyto be in the box and hopefully I will get a goal for it.”Of course it was a disappointing moment in the summer, but it’s football. It’s what makes and breaks you as a player.”In the Premier League last season, Kane took just seven corners for Spurs. Against Russia, he took six. Old boss Roy Hodgson said after the game: “I don’t need to apologise for Kane taking a corner.